Radios which combine DAB/DAB+, FM radio, Bluetooth and Internet radio are versatile additions to any room. The Pure Evoke F3 handles all of these, as well as Spotify Connect for wireless music streaming. The Evoke F3 receives DAB and DAB+ stations, in addition to FM radio stations which are not on digital radio. The ‘scrolling text’ is shown on the display for digital stations. Presets can be set for both digital and analogue stations. More than 25,000 Internet radio stations are available through the device over Wi-Fi. Radio stations exist around the world for almost every genre of music and talk. This function can also be used to tune into UK stations that aren’t available in every part of the country – such as Planet Rock or Magic Soul. Podcasts can also be found through the Internet radio menu; a good option for anyone without a smartphone. Bluetooth speakers have grown in popularity in recent years as listeners play audio on their phones and tablets. The inclusion of Bluetooth in the Evoke F3 makes it possible to listen to music, podcasts, audio books and other media on a smartphone. This works particularly well in kitchens when appliances can drown out the small speakers on phones. Spotify Connect makes it possible to play music from a Spotify Premium account. The Spotify app is required on a PC, tablet or phone to control the music. Tracks on Spotify cannot be selected directly from the radio. Media streaming over a network is also possible, with WMA, AAC, MP3 and FLAC playback supported. 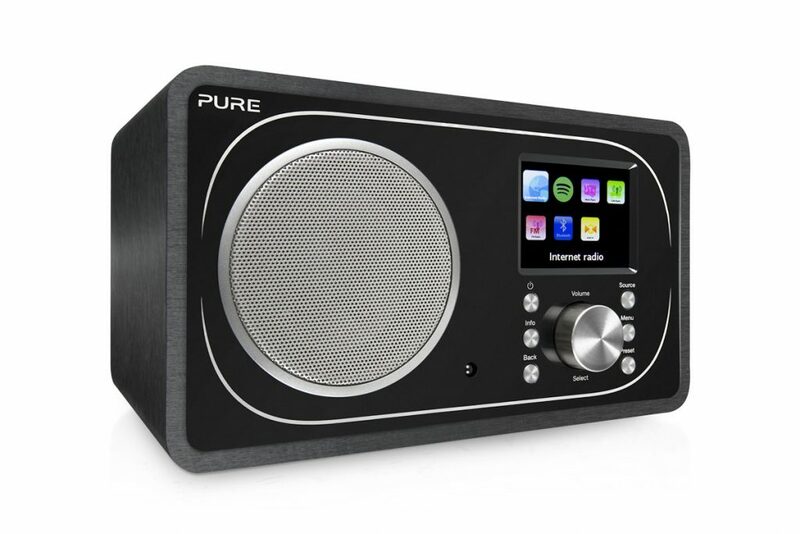 The radio looks similar to the Pure Evoke F4 which it replaces. A colour screen shows extra information and the company says the sound has been “hand-tuned by Pure’s audio engineering team”. When the radio is switched on for the first time it will ask whether to run the setup wizard. This will help connect to Wi-Fi, but can be skipped. For owners with an amplifier or AV receiver there is a line-out socket. This could be ideal for occasions when the 5W RMS speaker isn’t enough for a Spotify party playlist. The aux-in socket means the speaker can be used to play music from a device without Bluetooth, such as an older iPod. The Pure Evoke F3 comes with two alarms and one sleep timer. Alarms can be set through the menu with a buzzer, DAB, FM and Internet as options for the alarm mode. A welcome further option is to select a preset from the radio modes for the alarm, or simply the station listened to last. Used in combination with the sleep timer it’s possible to go to bed with an Internet jazz station and wake up with BBC Radio 4 on digital radio. Sleep timers are available in 15, 30, 45 and 60 minute durations. In the box is the Pure Evoke F3 itself, a power adapter, remote control and quickstart guide. A full manual is available on the support section of Pure’s website. The remote control has buttons for standby, volume and mute. It can also be used to select the source (e.g. DAB, Internet radio, etc) and control playback when listening to music. Numbered buttons can recall presets and the sleep timer can be set with the ‘Zzz’ button. The Pure Select app can also be used to remotely control the radio. Verdict: The Pure Evoke F3 builds on the features in the previous F4 model, but adds Spotify Connect and a colour screen. The various inputs and included connectivity make the Evoke F3 a great addition to any room.